Jeudi 24 mai 2018 de 11h à 21h. Vendredi 25 mai 2018 de 11h à 12h. Purchasers will pay in addition to the hammer price, a buyer’s premium of 24% (VAT included). 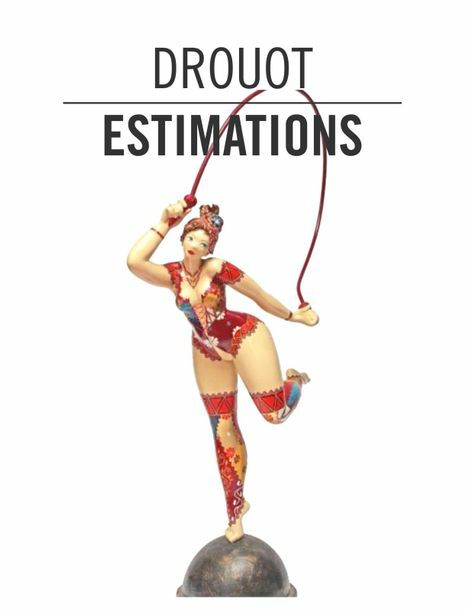 In accordance with the law, DROUOT ESTIMATIONS is responsible for the contents stated in the catalogue, subject to amendments announced by the auctioneer during the sale when presenting the lot. No complaint related to restorations, small accidents, and condition will be accepted as the public exhibition allows a proper examination by the buyer. Anyone wishing to set up a phone bid will need to send a request by email, attaching a copy of his ID and bank details, at the latest the day before the sale. Experience reveals that communications are not always possible due to technical problem or lack of reception, therefore a phone bid request assumes that THE BUYER AGREES TO BID TO THE LOW ESTIMATE PLUS ONE MORE BID in case the connection is lost for any reason. Should the buyer fail to pay the amount due, and after notice to pay has been sent to the buyer without answer, the lot is re-offered for sale at the seller’s request, under the French procedure known as “procédure de folle enchère”. - By certified cheque or crossed cheque in euros, upon presentation of a valid passport. In case of payment by non-certified cheque, the collection of purchase may be postponed until the money has been received. Any buyer who wants to execute payment by bank transfer issued from a foreign account must take in account additional fees from his bank remaining at his own charge. - In cash (decret of June 24, 2015) : up to 1 000 € (inc. premium) for French citizens or professionals and up to 15 000 € (inc. premium) for foreign citizens upon presentation of valid passport and evidence of residence abroad. If the buyer has no carrier, any request for shipping will have to be made directly to Drouot Transport (01 48 00 22 49, drouot-transport@drouot.com). Payment for the transport must be made directly to Drouot Transport. 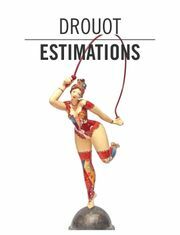 Any lot bought from Drouot Estimations and not collected on the day of the sale, will be sent and stored at Drouot Warehouse with daily storage fees applying (contact: 01 48 00 20 18 - magasinage@drouot.com). Any purchased lots that have not been collected or brought back by the auction house will be sent to Drouot Storage, located in the 3rd basement of Drouot. *No fees are charged when the service is closed. A week of storage is offered for purchased lots shipped through Drouot Transport. Lots shall be released upon production of the paid invoice and/or the lot’s label.